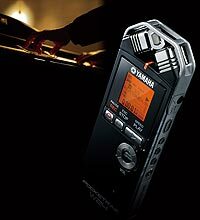 The Pocketrak W24 is the senior partner of Yamaha's two pocket-sized solid state sound recorder offerings. Whilst it is a little larger and heavier than its little brother, there's really only a few grammes in it. But, whilst the slightly smaller and lighter C24 is great for the kind of recordings we might call 'note-taking' or practising, the W24 features a large dual microphone assembly for more serious recording tasks - for performances. With really outstanding stereo sound quality. What’s more, with the W24 recording is more convenient than ever thanks to the supplied wireless remote control. It’s the perfect choice for effortless recording in the studio, on the stage or out in the field. The wireless remote control makes recording practice sessions much more convenient. You can position the W24 at the optimum recording location and operate it from your playing position, so you can record and listen over and over without having to move. 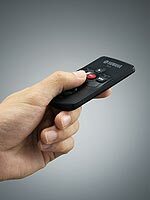 The remote even has level control on it. The microphone on a pocket recorder is extremely important in determining sound quality, and the sensitivity and coverage of this X-Y dual mic assembly are truly superior. 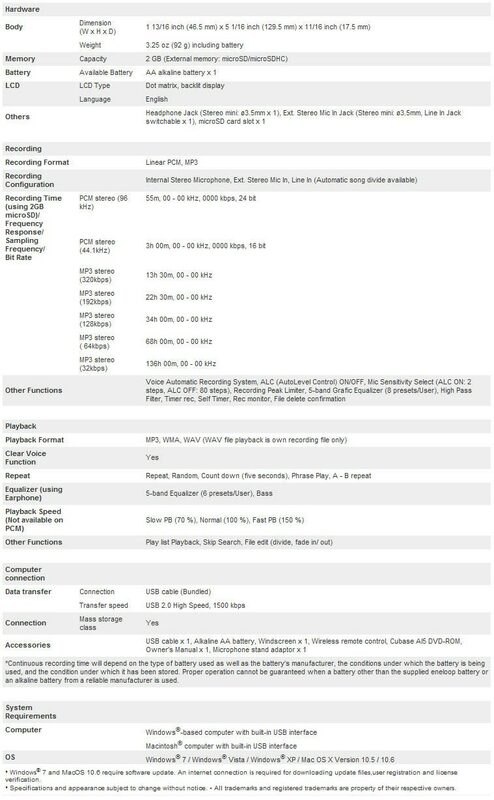 It takes full advantage of the recorder’s 24bit/96kHz resolution. Surprisingly, this small pocket recorder offers digital audio recording with 24bit/96kHz resolution, which is higher than CD quality. Thanks to Yamaha's technology, small size is not a sacrifice. Naturally, you can also use the MP3 format for longer recording or recording for transcription. The W24 offers significantly longer recording time than comparable models. A single alkaline AA battery will power the unit for up to 56 hours in MP3 mode and up to 38 hours in the higher quality PCM mode. The built-in tuner makes pitch adjustments easy and convenient. The metronome is also handy, giving you the desired tempo via both sound and LED. And you can record the music without recording the metronome sound. There is also a 5-band equaliser, high-pass filtering for reduction of rumble (e.g. from wind-noise), Auto Level Control (ALC) and a Recycle Bin for retrieval of deleted files. The W24 has a built-in 2GB flash memory, providing 13.5 hours of MP3 recording time (PCM: 3 hours). There is also a microSD card slot for more memory. See inside the brochure* for card capacity details, and our webshop below for pricing. When bands or orchestras hit high volume peaks, recording quality can suffer. The W24’s peak limiter instantly detects these high levels to prevent overload and distortion. Yamaha worked with musicians in studios to ensure that the limiter function is optimized for music recording. You can use the Scene function to memorize the settings for a variety of recording situations, such as choir practice or interviews, and assign names to them. Then each time you want to use a certain setting, you can recall it instantly. *On page 12 of this product's brochure the text suggests that the W24 comes with a 2Gb microSD card as well as its 2Gb of internal memory. This is a textual error and the W24 is not, in fact, supplied with a 2Gb microSD card. However, it does come with 2Gb of internal memory. You may purchase extra memory in the form of microSD cards (see our webshop below) to fit into its external memory card slot.